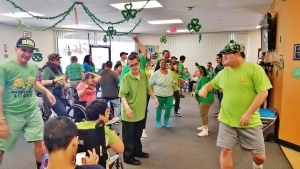 This week in Covina we had several things going on…..
for one we were preparing for our annual St. Patrick’s Day Party on Thursday the 17th……..what a party! Fill with laughter, green punch, green beads, 4 leaf clovers, leprechauns, and music. clovers to add to the facility decorations. 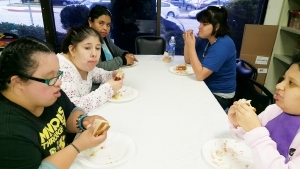 We also had a lesson plan that called for tuna sandwiches………group 3 took the challenge on and knocked it out of the park!!! 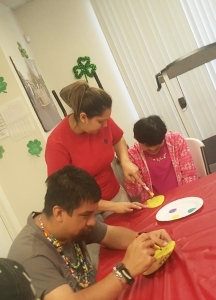 Group 1 was busy moving forward with the next holiday and they were decorating, painting, and creating some really cool Easter Eggs.